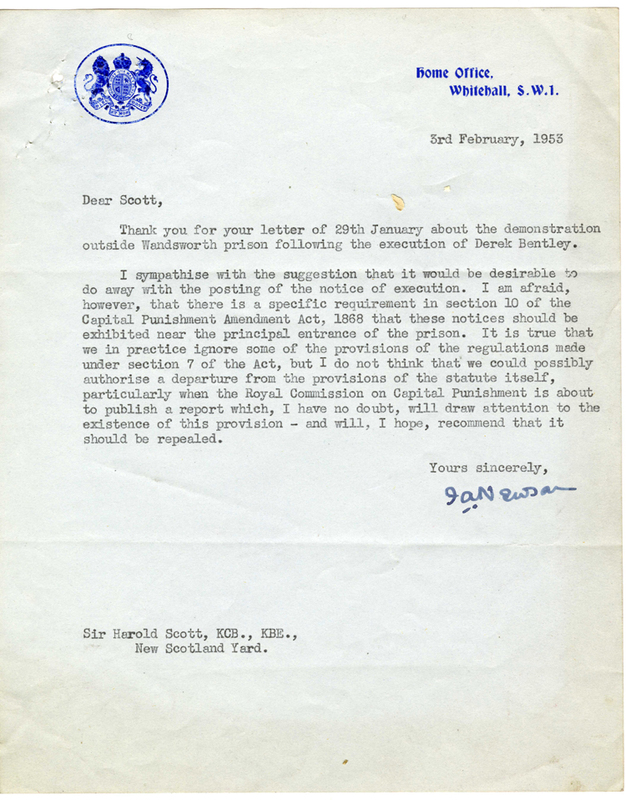 Thank you for your letter of 29th January about the demonstration outside Wandsworth prison following the execution of Derek Bentley. I sympathise with the suggestion that it would be desirable to do away with the posting of the notice of execution. I am afraid, however, that there is a specific requirement in section 10 of the Capital Punishment Amendment Act, 1868 that these notices should be exhibited near the principal entrance of the prison. It is true that we in practice ignore some of the provisions of the regulations made under section 7 of the Act, but I do not think that we could possibly authorise a departure from the provisions of the statute itself, particularly when the Royal Commission on Capital Punishment is about to publish a report which, I have no doubt, will draw attention to the existence of this provision- and will, I hope, recommend that it should be repealed.